Running back Saquon Barkley moved onto the NFL but Coach James Franklin can rely on senior Trace McSorley to keep the offense on track. He is the top returning quarterback in the Big Ten and has posted a 22-5 record as a starter. As a sophomore in 2016, McSorley guided the Nittany Lions to a Conference Title and was named MVP in the Championship Game. He also earned the Most Valuable Player in the PlayStation Fiesta Bowl last year. Over the past two seasons, he has totaled 7,194 passing yards, 856 rushing yards and accounted for 75 touchdowns. In school history, he is the only triggerman with over 50 aerial strikes and ranks second in passing yards with 7,369. The Penn State signal caller enters the season with the longest active streak in the FBS with at least one touchdown pass in 28 consecutive games. At 6-foot-0 and 198 pounds, McSorley is an intelligent decision maker, quick thrower and playmaker with his feet and arm. A Heisman contender, former NFL pitcher Trent Dilfer compared McSorley to last year’s Heisman winner Baker Mayfield after the Elite 11 Camp in the spring. Despite the numerous changes on offense, McSorley should produce another stupendous season for CFF diehards. The senior signal caller took a road less travelled to arrive in Oxford, Mississippi. A three-star high school prospect in Hawaii, Ta’amu attended New Mexico Military Institute (JUCO), and earned the 2016 Southwest Junior College Football Conference Player of the Year. Afterwards, Ta’amu signed with Ole Miss and lined up behind center when Shea Patterson suffered a season-ending knee injury last year. His first start came against Arkansas, and he passed for over 350 yards in each of the next three games, throwing seven aerial strikes. When the dust settled, he completed 66.5% of his passes and produced an 11-to-4 TD:INT ratio. Patterson transferred to Michigan, and Ta’amu is the undisputed starter in 2018. At 6-foot-2 and 212 pounds, he has the stature of a classic SEC field general, but a far different demeanor. A laid-back competitor, the senior listens to instructions well and has the confidence needed to excel on the field. Offensive coordinator Phillip Longo adjusted his coaching techniques to bring out the best in Ta’amu as a quarterback. CFF diehards can send a letter of thanks to Longo for coaching the Rebels’ leader to fantasy prominence in 2018. Anyone who follows me on Twitter, or listens to my CFF Podcasts, already knows that I am a huge UConn Husky zealot and own season tickets for the past seven seasons. Last year, I sat on the 15-yard line during Missouri’s 52-12 demolition of UConn at the Rent in West Hartford, CT. While completing 83.8% of his throws, Lock tossed five touchdowns and passed for 377 yards: It was an outstanding performance. In 2017, the senior signal caller established single-season records for the Tigers—and the SEC Conference—with 44 touchdown passes and was named to the first team ALL-SEC. Missouri opened the season losing five of the first six games; yet, Lock, the team captain, did not surrender, and the Tigers rebounded in the second half of the season, earning their first bowl invitation since 2014. The 6-foot-4 and 225 pounder decided to return to campus in the fall after debating the possibility of entering the Draft. He made the correct decision: Lock needs to gain game experience, limit mental errors, and improve his skill set. I will be watching Lock’s improvement closely all season. CFF managers should grab the Tigers’ pocket passer and enjoy the journey throughout the fall. College fantasy footballers must analyze offensive schemes in order to make projections of players promoted into the starting lineups. Over the past four seasons, Coach Bobby Petrino’s passing game has averaged 3,491 yards and 25 touchdowns. A redshirt sophomore, Jawon Pass now drives the Cardinals’ offense in Louisville, Kentucky. At 6-foot-4 and 231 pounds, the big-armed passer was a four-star recruit out of high school with the physical tools to succeed in college. He has been groomed in Petrino’s system for two years, and in limited game action, Pass has connected on 23 of 33 throws for 238 yards and two touchdowns. During the Cardinals’ spring game (Red vs. White), the sophomore passed for 342 yards and three touchdowns. Louisville employs dangerous wide receivers (Sr. Jaylen Smith and So. Dez Fitzpatrick) who should allow for an easier transition from the sideline to the huddle for Pass. Louisville kicks off the campaign with a primetime matchup versus Alabama, and the Cardinals’ dual-threat quarterback will be immediately challenged to prove himself on the field. It is much watch television for college fans. Afterwards, the schedule presents only one other big-time opponent: On the road against Clemson in November. Draft the newest starter in Petrino’s offense and enjoy the weekly production throughout the season. Without question, Coach Ken Niumatalolo’s triple-option offense provides annual dividends at the quarterback position. The yearly rushing production from the Navy quarterback is unparalleled in college football: Over the last three years, the Admiral of the ground game has averaged over 1,500 rushing yards and 25 touchdowns. In 2017, Zach Abbey and Malcolm Perry combined for 2,393 yards and 23 touchdowns. Coach Niumatalolo has guided Navy for 11 seasons, and in the offseason, he stated that Perry “is the most dynamic runner” during his tenure. Last year, he only started three games behind center and rushed for 646 yards and seven touchdowns. At 5-foot-9 and 185 pounds, he is possibly the most elusive player in the open field in the nation. Unfortunately, he is a limited passer only putting the ball in the air three times last season. When Abbey is in the game, Perry will likely line up at slotback but will still get touches. The Houston Cougars have quietly produced some of the most prolific passers in college football history: Andre Ware, David Klingler, Kevin Kolb, Case Keenum and Greg Ward, Jr. Now, D’Eric King gets an opportunity to lead the Cougars’ offense. An incredible athlete, King opened the 2017 season at receiver and made 29 receptions for 264 yards and two touchdowns. He moved to quarterback and started the final four games behind center, leading the team with 1,260 passing yards and seven touchdowns. King also tied for the team lead with eight rushing touchdowns while averaging 5.3 yards per attempt. He earned the AAC Conference Offensive Player of the Week after leading the 28-24 upset over South Florida. At 5-foot-11 and 190 pounds, King shined brightly during the Cougars’ annual Red & White spring game, completing 8 of 13 passes for 259 yards and two touchdowns. Coach Apple White begins his second season on campus and new offensive coordinator Kendal Briles plans on implementing an exciting up-tempo passing game. During the past seven seasons, Coach Urban Meyer has steered the Buckeyes to a 73-8 record, and over the last two campaigns, he depended on QB J.T. Barrett to put points on the board. However, Barrett graduated and three players battled during spring practices to govern the Ohio State machine next. In mid-June, Meyer named Dwayne Haskins the starter entering training camp. A pure passer, he was a consensus all-Maryland and 4-star prospect coming out of high school. Many scouting services ranked Haskins as a Top 5 pro-style competitor. 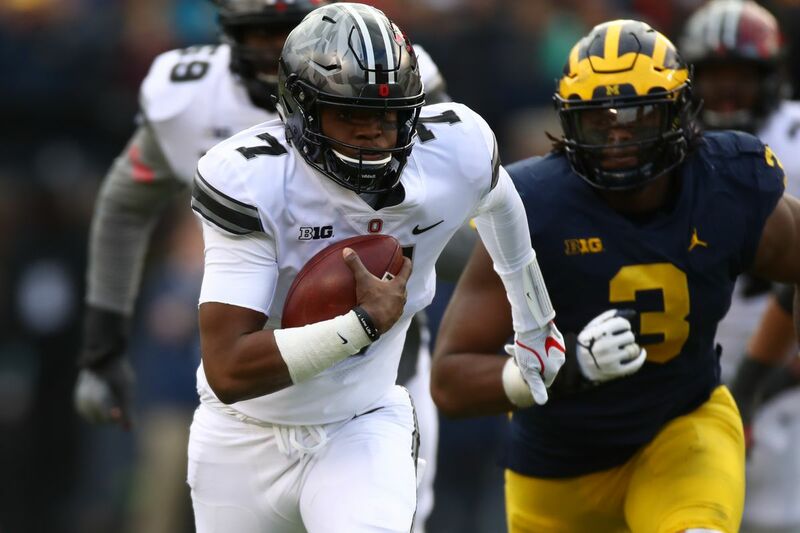 At 6-foot-3 and 218 pounds with a terrific arm, Haskins demonstrated his abilities when he led the Buckeyes to a victory over rival Michigan after he came off the sideline to replace Barrett. Last year, he saw some action and passed for 565 yards and 4 touchdowns while completing over 70% of his passes. He is also an OSU Scholar-Athlete majoring in journalism. Ohio State returns its top six wide receivers and two 1,000-yard rushers—J.K. Dobbins and Mike Weber—in the backfield. Haskins inherits a proven system under Meyer, which foretells fantasy success in 2018. Over the past two seasons, Eric Dungey has teased CFF owners. He has started the opening nine games of each campaign before missing the final three, which corresponds with the CFF playoffs. Many college fanatics will dismiss the three-year starter after injuries derailed Dungey while astute managers will take a closer look. Dungey has a school-record nine career 300-yard games and two 400-yard outings. Along with Donovan McNabb, he is the only quarterback in Syracuse history with over 6,000 passing yards and 1,000 rushing yards. Last October, Dungey guided the Orange to a 27-24 victory over Clemson. At 6-foot-3 and 228 pounds, he is a tough playmaker who rehabbed and returned to spring practice to fight for his starting position. Coach Dino Barbers has only won eight games at Syracuse in two seasons and wants to end a four-year postseason drought—the longest in the ACC. Barbers can lean on five returning offensive lineman and his senior signal caller in 2018. Dungey is largely being overlooked and comes at a major discount in drafts this summer.